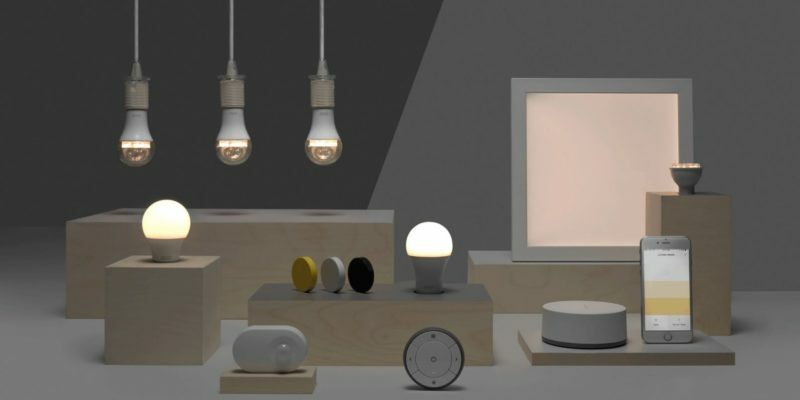 IKEA's Trådfri smart lighting system is now officially compatible with HomeKit, Apple's smart home management platform. The support was confirmed in IKEA's response to a question posted on its Facebook page this morning, after a customer noticed a change in the technical specifications on the company's Trådfri product page. According to a thread in the Philips Hue developer support forum, IKEA's smart lighting bulbs are now also compatible with the Philips Hue Bridge, once the products' software has been manually updated. Existing Trådfri gateway owners need to ensure they have the latest firmware upgrade for their devices to pair them with Amazon Alexa, Apple HomeKit, or Google Home. IKEA had promised HomeKit support for its affordable range of home lighting products back in May. The system was originally announced in late March, and includes LED bulbs, illuminated panels, a motion sensor kit, a gateway kit, and dimming lights. There has been information going out today about the compatibility of TRÅDFRI. We can now inform you that TRÅDFRI is not yet compatible with Apple, Amazon and Google. The plan is that everything will work as we'd like this fall. We are very sorry for the confusion! Note: This does not apply to the Philips Hue Bridge compatibility, as reported from the separate source above. That's the $64k question right now. But any Ikea bulb that is running the new firmware will be recognized by the Hue 2.0 hub and therefore also work with HomeKit based on those that have already tried it. This is a boon to those of us with a Hue setup as we can now use the lesser expensive alternatives from Ikea if we so desire. Yep thats exactly what I'm thinking. I have a hue set up already and I love the colour bulbs. But for areas where I don't need colour and just want normal white bulbs the ikea ones work out as a great price alternative, especially with things like the motion sensor to factor in which a great price. The HomeKit code is a backup method, it is not required to add a device (it should appear automatically in the Hue app). I thought the AppleTV could be used as a gateway. Nope, it just allows you to connect to the homekit devices when you are AWAY from home. Does this mean I can buy Ikea bulbs now and connect to my existing Hue Hub (v2)? OR to update the bulbs (to work with hue) do I need to purchase the ikea bridge to perform the update? Very good move, IKEA. They didn't promise any HomeKit support at the beginning and yet they developed quickly an update. Bravo. LIFX instead promised HomeKit for ages and users are still waiting for an ETA. Come on, LIFX, wake up! The Ikea bulbs with firmware 1.2.217 are now working with the Philips Hue hub and therefore HomeKit. It's likely that an update to the Ikea gateway is imminent. (UPDATE): Ikea is now saying their gateway/hub will be updated in the Fall, but their bulbs do work as of right now with Hue and it's HomeKit compatible hub after applying the newly available update). Just in case anyone with Ikea bulbs doesn't already know, its already possible to connect the bulbs/panels to HomeKit using a piece of free software called HomeBridge, you will still need an Ikea Wireless Hub for this to work though. Ok, so the downside is that you need a computer to run HomeBridge for you, but you can either install it on a Mac or if you have a raspberry Pi that is the cheapest option ( I think you can buy a rPi zero for under 10 pounds ). So you install HomeBridge, then install the 'Ikea' plugin and that's all you need to do, the Ikea plugin will automatically find the Ikea Wireless Hub and then send all your bulbs/panels to HomeKit and they just appear like any other bulbs, you can turn them on or off, change the brightness, or the colour, and use Siri to control them. I've been using this for a few weeks, I've got 5 Ikea bulbs and 2 Ikea panels connected, and another advantage of the HomeBridge software is that it works with other IoT appliances not just Ikea. So I've also got 3 TP-Link wireless plug sockets, they are very cheap because they are not HomeKit compatible, but with the HomeBridge plugin I can also control them using Siri via HomeKit. It's lovely to see the leading systems becoming cheaper and more interoperable. This move by ikea could potentially be massive.